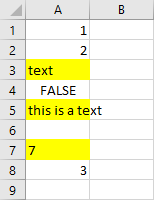 If you have a large amount of data and you want to find text values and distinguish them from the other types of data, you can do it by applying the formatting. It can be text color, background color, etc. In this lesson, we are going to do it using two different ways. 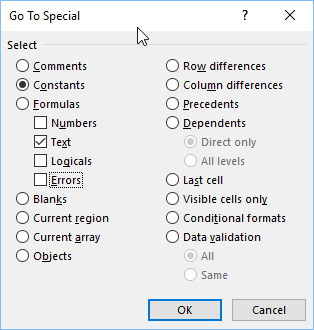 First, select the range in which you want to find data. Navigate to Home >> Editing >> Find & Select >> Go To Special…. 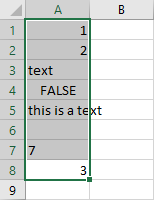 Click Constants and uncheck all positions, but Text. Three values are selected. 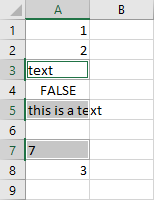 Cell A7 is also selected because 7 is formatted as text, not number (‘7). Now, you can format the cells by changing the background color. Go to Home >> Font >> Fill Color. You can record a macro to see how the code looks like. It’s going to create a lot of unnecessary code. After removing a few lines, we are going to get this simple code. In the first line of code, it’s going to select the second position under Constants, which is Text. After selecting all text values, it’s going to fill them with yellow, which is represented by the number 65535.